Many years ago, when I started dancing tango for a second time, I felt quite uncomfortable in the tango community. This had nothing to do with the dance or the music - I liked all that from the start. But the many mannerisms in the tango world did not fit my rather plain and outspoken manners. This applied in particular to the typical greeting customs. The kisses between almost-strangers, two or three, sometimes even four on the cheek, often combined with loud exclamations of joy, as if you were greeting a long-lost family member! I am - after all - mostly German, and have not imbibed such habits culturally. The only people I would kiss were lovers and close gay friends, not even family. By the way, my Catalan relatives were quite reserved as well - you'd have to search hard for a more effusive Mediterranean element in my upbringing. Hence the instinctive rejection of everything over the top. Detlef - who did not know me personally yet - apparently used to call me "the woman who never smiles". Naturally over time, I came to terms with the besitos, bisoux and baci. 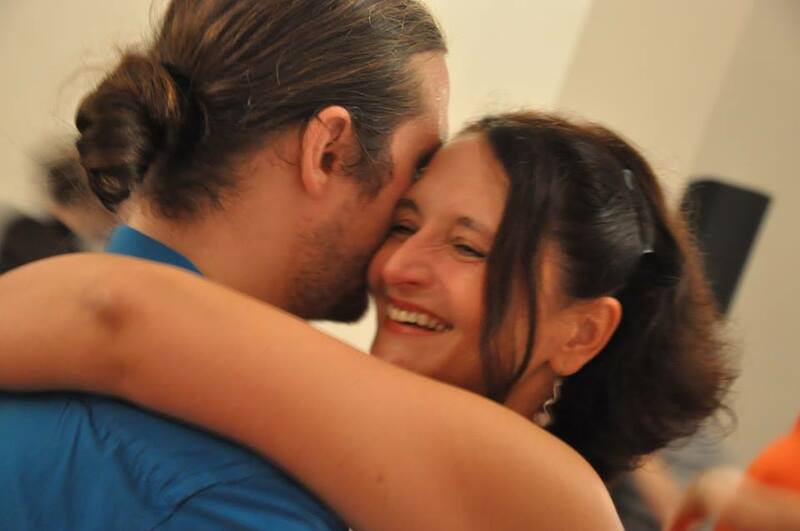 Most of you will know, what I mean: you suddenly find it normal to kiss 50 strangers at a milonga and have to pay attention to not greet your postman the same way. You don't even have to like it - but the sheer force of habit! In the first years, I completely freaked out my friends, who were either used to a very brief hug or just a nod and hello. For them, the kissing felt totally phoney. Luckily they told me so and we got back to our normal forms of greeting. But kissing is not the only issue. If you teach tango professionally and do not have a normal "work life" anymore, the informal ways of communication in the tango community will influence other fields as well. Apart from my sweetheart and a few old friends or family-members, my contacts to non-tangueros are limited to the odd salesperson and - once in a while - a doctor, accountant or bureaucrat. This is why I am not used to displaying "grown-up", formal behaviour any more., like e.g. shaking hands with someone. And: In tango, you will mostly use first names. In real life, you only address friends and family by their first names and in Germany you will furthermore use the formal "Sie" when talking to anyone else. But after so many years, this now feels un-natural for me. And as most of my written communication is with tango organisers and clients as well, this even affects my letters to non-tangueros. I think my landlord is constantly shocked by my overly casual mails. When dancing and teaching with such a constant focus on the close embrace and intimate connection, you get used to a very physical contact with other people. There is quite a risk of loosing the feeling for other people's personal space. More so, as I have many good friends in the Encuentro community, where constant hugging outside of the dance floor feels so natural, not only to greet someone. Some say, that these friendships are superficial and that you do not really know most of the people; that all is fake. But does this matter in the moment? I remember e.g. a wonderful hug with a female friend during a Di Sarli tanda. We stood silently outside the dance floor, not talking, not moving, only embracing. I felt safe, loved and very much at peace. It does not really matter, if I don't know your parents or your profession. We can still feel close and one can get addicted to that form of nearness. So whilst I once perceived the kissing as an invasion of my personal space, I now sometimes feel rejected when someone greets me in that manner. I ask myself: why is that person so distant? Does he or she not like me? Have I done something wrong? And then I remember that not all tango people are used to the intense greeting with a heartfelt hug, in particular not newcomers, whom I don't want to affront. This is why I now constantly have to run a mental programme when interacting with all kinds of people, tangueros and non-tangueros alike: How do I address this person? Is a kiss (or two or three or four) appropriate? How near can I stand to someone, how appropriate is it to touch this person, can I hug him or her, and if so: how long and intensely? It is a little irritating and gets even more confusing, if you take into consideration the various forms of interaction in different cultures. But apart from that slight disturbance in my behavioural patterns: Am I not lucky to work in an environment that allows for such close connections? With there being so many lonely people in the world who are longing for the slightest physical contact, I've got embraces in abundance! For this I thank you, my tango friends. Do not misunderstand me. I still don't wanna hug or even kiss anyone anytime. There are still people I don't like or moments when I need my personal space. Sometimes, you'll just get a nod and hello or "Mahlzeit". But you'll know how I feel, because I will never I never be "touchy-feely Melina" who embraces the whole world in-distinctively. Neither studying psychology, nor doing Yoga could turn me into that person. Tango won't either. I still believe that a smack on the head would do some people a lot of good and - as you know - there are quite a few tango-habits that I will never get used to. So, no need to fear that "nasty Melina" has been replaced by some lovey alien. I am still me. The strong need to write this last paragraph proves it. Tango is an art, it is a social dance and it is a business. Understanding these different aspects of tango is crucial when it comes to making informed decisions about what events you go to, what teachers you choose and how you want your dance to develop. So this post is about priorities and money well spent. When it comes to choosing tango events, many people make conscious and well-informed decisions. Since the turn of the century, the tango community has grown and diversified and there are now events for all tastes. (Check out this post from last year.) There are of course dancers who love all sorts of events, but most of us have preferences. I think that’s a good thing, because knowing what you like and where to find it will minimise the risk of being disappointed. But are tangueros and tangueras as careful when it comes to making general decisions about their dance and with whom they want to study. I am not so sure. We are regularly teaching in Basel (Switzerland) in the form of consecutive intensive seminars - 4 hours on a Sunday over the course of 3-4 months, 1 class each month. People will book the entire seminar, that are accompanied by a guided practica. The groups are limited to 10 couples and we drive from and back to our hometown on the same day. Six hours of driving and 4 hours of teaching on one day ist quite exhausting and we ask for an appropriate salary. So these classes are not cheap and if someone commits to such a course format and is willing to pay a considerate sum of money, you’d think that they inform themselves in advance about what to expect. But this is not always the case. Last Sunday was the first module of the new series - a Milonga seminar. As announced in the class description, we started with an half-hour-session of bodywork on yoga-mats. I immediately noticed a gentleman, who did not take a mat and preferred standing in the back without doing the exercises. I did of course not insist that he participate. For all I knew, he might have a health issue. During the entire class, our special participant was obviously not willing to really commit to the class objectives. His facial and corporeal expression was defensive, if not hostile. As he was also struggling with the execution of the exercises, we of course offered feedback and help as we did with everyone else. He did not even show a positive reaction when being addressed personally in a friendly manner. After class he told the organiser, that he would not come back for the rest of the seminar. He did not feel cared for and would have preferred that we showed more steps which he then could have repeated, like the argentine couples do. (His words, not mine.) In addition to that, the organiser hinted that the gentleman may not be used to receiving an honest feedback as most teachers in that region usually praise without offering alternatives. So our guy was upset and quit. This is sad and I wonder, if we could have done anything else to improve the situation. Maybe. I will certainly analyse it in-depth to do better another time. But I feel strongly, that there was not much that we could have done. I think we were not the right teachers for him and that he was looking for something that we would not provide. This is why I reckon, he cannot have read the class description or checked our website in advance. A purely frontal classes with step learning was not what we promise - on the contrary. So is he to blame for his disappointment? How many teachers will claim that they teach social tango and don’t show steps but rather focus on connection or musicality? Workshop description are often exciting reads. But when you visit the class, leaders and followers will have to stand on opposite sides of the room and practise complex moves independently from each other. So how can clients rely on anything that is published or even be bothered with reading it? After all, any written material ist of a promotional nature and professional teachers are trying to attract and not to put off dancers. How can we avoid such situations? How can future clients really inform themselves about the product they buy and therefore improve the chances that both students and teacher are content with the work. Please live what you teach. Don’t advertise falsely. If you want to teach a social dance, please dance socially! If you want to teach complex and acrobatic moves, take dance classes, practise every day and make them look as perfect as possible! If you claim to be good teachers, please prepare your classes properly and constantly work on your teaching methods or skills! In any case: if you take money for a product, please take what you are doing seriously! It’s a job - for god’s sake. Do not rely solely on what any teacher writes. Look at what he or she does and examine the results of their work. Then make a decision based on what you want to achieve in tango. So this post is ultimately about defining one's priorities and then choosing appropriate products. The following is a description of the steps of such a decision-making process. Ask yourself whether you really want to work on your dance and are willing to learn, maybe even change? Or are you happy with where you stand? I am happy with what I know and do; I don’t need to develop any more - this is perfectly fine. Don’t force yourself to take classes, because everyone else does or if you go, comprehend them as an entertaining activity. But do not visit any classes in which your abilities might be put into question. If you are not willing to receive an honest feedback, the result can only be frustration for both you and the teachers. Also: please do not expect to dance with all the top dancers. Unless you are already perfect (which is unlikely, because no one is ever), they might want to develop and could be looking for something different in the dance. Although I am a teacher, I don’t think, that one has to learn and improve constantly. If you are happy with your abilities and the resulting situation then why should you? Spend your money on a nice pair of shoes! I mean it. Yes, I am curious and there are things that I want to improve or change - then you should try to define your priorities and goals. Without knowing what you want to achieve, the hole learning process will take much longer and you are going to spend a lot of money on trial and error. Do I want to dance elegantly or is this not my priority? Do I want to decorate my steps? Do I want to be challenged with complex movements or am I happy with simple variations of the walk? Do I want to dance tango shows, do I want to become an artist or do I want to dance socially only? Do I want to feel comfortable and want to be invited for my nice embrace? What kind of music do I like and how do I want to interpret it? What is important for me at this stage of my tango life? Why don’t you make a list of priorities in a ranking order? You can see, that elegance e.g. is not one of my priorities. If elegance develops from a harmonious movement and a good technique, then I am happy. But I would not compromise general relaxation and comfort for looks. This is my personal choice. You have to make yours. If elegance is top priority for you, you will need an appropriate technical approach, e.g. working with projections to make your legs look extra long and straight. Every technique comes with advantages and disadvantages and you should choose them according to your priorities. So, let us say that you have defined your personal priorities and goals. Most likely taking classes will (apart from serious practise) be one instrument to achieve your goals. This means choosing appropriate teachers. The next paragraph will therefore deal with sources of information and with questions to examine. 1. Read what they write. Please read what teachers have to say about their methods, class-contents and their general philosophy. Do you agree? Do you share the same ideas? Good. Please proceed with the next paragraphs. If not, find other another teachers to look into. But be aware: there is the issue of language. We all use it differently. For someone, improvisation will mean putting together different steps, for someone else it is deciding each moment, which single element to use. "Technique" can be understood as general bodywork, posture, communication and execution of very basic elements (e.g. a pivot) or it can be understood as steps. Also: the teacher's native language may be another than your own and a third language (often english) will be used to communicate. So there is a huge potential for misunderstandings. Additionally - as discussed above - whatever you read (class descriptions, flyers, websites, blogs - yes, also this one) is ultimately promotional material. I don’t want to imply, that all texts lie. Many teachers will surely advertise with the best intentions of describing their product and motivations properly. But even the most honest text will still not be conclusive, because it does not tell you everything you need to know. So written material might be helpful to exclude teachers, but you will need information from other sources to decide whether you really want to work with a particular person or not. Please ask yourself: Do I like what I see? Do these teachers dance complex steps or do they focus on seemingly simple moves? Do they dance musically? Do I perceive them as being elegant? How does their embrace and posture look, comfortable or stiff? Do I see anything at all that I would want to study? A few hints: If you see a dancer decorating her every move and making lots of high boleos as a result to the most subtle invitation, but you currently want to focus on the embrace, better don’t go to the boleos class. If you see a couple mostly walking to the music and not executing any giros with enrosques in an open embrace, please do not expect them to teach these movements. 3. Check out the teacher’s activities and behaviour at milongas. Inform yourself: What is their background? Do they dance in a tango show and understand themselves as artists? Do they visit local milongas or other social tango events? Do they dance with each other or professionals only? Do they dance with "normal" dancers? How do they behave on the dance floor? Do they show off or adapt to the ronda? A few hints: If the couple in question does not visit social dance events or will only dance with each other - don’t take their class on adapting your embrace to different partners. If they disturb the ronda with their fancy moves, don’t expect them to teach a tango that is fit for the social dance floor. But: The skilled artists might nevertheless be the perfect teachers for you to develop a complex repertoire if you are planning on performing in a theatre or if you are looking for a practise challenge. I am no artist, so please do not expect me to teach you a lot of things that will impress an audience. But by watching me dance at a Milonga, you could come to think, that I might help you to enjoy a tanda of Biagi or Di Sarli! A note: many teachers (including myself) will be tired after a day of workshops and may not dance a lot during workshop engagements. So you might not want to base your decisions on the observations of one or two workshop-weekends only. And of course there are brilliant artists who are social dancers at the same time! If a couple is either teaching locally or is travelling internationally, there is the chance, that others have already taken their classes. Ask about their experiences. Did they like the class? Was it well prepared? What are the pedagogical methods of the couple in question? Do they teach frontally or do they interact? Do they show many steps or do they work on the basics? Is there additional class material? A hint to the decision making process: Please do not take a class of teachers that might engage you in group interaction, when you just want to receive input. 5. Look for class summaries on the internet. Class summaries do not only provide information about class-contents, but might also give an impression about general methods. There are e.g. no typical „end-of-workshop-dance-demos“ from Detlef and me on the internet. Why? Because we rarely show steps and will in any case rather make an extensive summary with explications in which we explain the basic concepts and then additionally send written material by e-mail. As we do not want dancers to memorise steps, we cannot just have them film the moves at the end of a class. In order to show what we do, we have uploaded two excerpts of class summaries on Youtube. They are quite old, but still give a good impression. One is in German, one is in French. Other teachers will have similar videos on the internet. Watch one or two of them before signing up for a class. If the class summary shows a long sequence of acrobatic moves, please be prepared for that kind of work in future classes. If they focus on small technical details, don’t complain if the they ask you to pay attention to those details in class. This is actually the most important criterion. If you don’t like what you experience, then don’t take that class. If you like their embrace, musicality, movements, navigation skills - go for it! But, as I mentioned in section 3: You cannot base such a decision on one or two samples only. Every dancer - including a professional teacher - will have a bad moment and not every student is a key to judging the teacher’s abilities and methods. You will need a little time to get a valid impression. Also: you cannot expect a professional teacher to dance with every potential student, so dancing with the students will be a more likely option. And ultimately, they are even more important, as they show the results of the teaching. Even the best teachers are not always super dancers and some of them will not even use their own principles. There are e.g. teachers who promote counter-body-movement in the parallel walk, but cannot apply it in their own dance. Others oppose to it officially, but still use it unconsciously. So dancing with students who apply these teacher's principles, will tell you much more about the content and quality of their teaching. It takes some effort to make informed decisions, but I think it is worth it in order to avoid mis-spending your hard-earned money - in particular if you plan on doing intensive seminars or tango holidays. Nevertheless, you might not always have the capacity or motivation to go through such a decision-making process. It is totally fine to take a chance and sign up for workshop spontaneously. But if you do, please do not show up with strong preconceptions. If you are openminded and prepared for surprises you might learn something valuable in an unexpected context or during an exercise that you cannot see the point in at first. Sure, you may also learn that you do not agree with these teacher's ideas or that you are looking for something completely different. But this is positive too, because it helps you define (or re-define) your priorities. So don’t be mad but rather try to make a better choice next time. Towards each end of a year, I have been posting my list of recommendations for next year's „milonguero“ events. For the last few weeks, people have been asking me when to expect my list for 2018, but I will have to disappoint. Those who are following me on Facebook know why: there are far too many new encuentros for me to keep track of as my time to visit events „just for fun“ is limited by my work-schedule. So I cannot „try out“ lots of new events or check, if the others are still recommendable. Even more: I find there is a real inflation with effects on the general quality. Every week, I hear of some new encuentro being created. Apart from the fact, that many of them just use the label without being „the real thing“, the sheer amount of events creates a huge competition amongst organisers and makes it impossible to find reasonable dates. At least not without forcing the dancers to making (sometimes quite painful) choices. Because of this, one of our Tangokombinat events - Abrazos in the UK - has been cancelled for 2018 after running successfully since 2011. There was just no way to find a free weekend in which there wasn’t at least one other event targeting the same audience in the desired period. So Andreas and Lynn decided to step back. Let’s hope they will find a solution for 2019. Also other established events have cancelled, like Carole and Bernard’s cosy encuentro in St. Julien Molin Molette - although the reasons for that might be different ones. As for the bigger choice of encuentros:I know that one might argue that it makes it easier to get into these events and that most of them still fill up nicely - although not as quickly as in recent years. Yes, that is true. But: in order to fill them, organisers will now admit many more dancers who do not actually share the „milonguero“ philosophy. I am not arguing for a pre-selection by dance level or creating „closed circle“ events only. Nevertheless, encuentros used to be events in which the huge majority knew how to behave in a crowded ronda, invite respectfully by mirada + cabeceo and dance in an unbroken comfortable embrace. A follower could dance with every leader without risking being lead into fellow dancers or risky movements. This is not anymore the case. Most encuentros are now populated by a very divers crowd, which usually creates more chaos on the dance floor and more uncertainty when it comes to choosing your dance partners. And honestly: we’ve already got the big festivals for that kind of ambiance. I could give many more reasons why I am not happy with this development, but let me just add: I am wholeheartedly for the integration of new dancers into the milonguero fold and there need to be opportunities to do so. There is the perfect format for that: the festivalito milonguero - an event with the ambiance and general organisation of an encuentro, but adding workshops, discussions and lectures that further social dancing and interaction. Unfortunately most of them have disappeared or been turned into pure encuentros. Embrace Norway is gone, so is Viento Norte and Abrazos had been transformed into an encuentro many years ago. Sure, many experienced milongueros now prefer to concentrate on either dancing or learning on a given weekend, but there were always enough newcomers who were eager to take this as an opportunity to immerse fully into the „milonguero spirit“. Only few festivalitos are left. In the second half of the year, I would like to go to some more dance-only events like Te Quiero Lisboa in Lisbon and maybe again Basel, Barcelona or an event in eastern Europe. I definitely have to keep some more weekends free of work, because you cannot teach a social dance, if you don’t dance at social events. But that’s another topic for another blog. Oh... for everyone who still find the list of last year's events useful, just click here. I have not written for some time. There was nothing that seemed very important and I was too busy anyway. But yesterday, I saw a video which I - very spontaneously and in an untypical manner - criticised on Facebook. It is a video of a famous teacher couple demonstrating a very long and fast sequence in a master class. From what I could see and from what I know about the target audience, I had the very strong feeling, that the participants would not be up to that sequence. Therefore found it hard to understand the value of teaching such a combination in this context. I was not as diplomatic as I have could been, so I have obviously offended others. It was made clear to me, that it is not for me to criticise professionals publicly. Sorry for that, but I think that critique and open discussions are important in every context. Every public person has to deal with that and what others have written about me, my dance or teaching is far more blunt than anything I would ever say. Some of that came from famous professionals. But this is not what I want to focus on here. The discussion ensuing after my observation is still ongoing. One main argument against my critique is that someone who signs up for a masterclass should well be prepared for a challenging move. I spend some time arguing that teachers should adapt their class content to the level of participants, no matter what the title was. This and the discussion whether teaching long sequences is sensible anyway is of course important, but whilst pondering about all that in bed, I have noticed, that this may not the main problem. The issue is rather of how to define a particular term: master. Who or what is a master? In order to make my point, I have to go back in time. Shortly after I had started dancing tango for the second time (I began in 1995 and re-started after a short break in 2000) my partner Detlef convinced me to taking some master classes with the usual suspects. I protested because I understood myself as a beginner and found it pretty presumptuous to attend such workshops. During these classes, I noticed that I could easily do the movements and got bored quickly. Sure, I did not have to lead them; I was young and skinny and had danced all kinds of other dances for many years. Throwing my legs into the air and running around a partner seemed easy enough at the time. Still: something was wrong. But I did not dig deeper. How did I continue? Well… Having done lots of jumping and kicking already, I was not very interested in that kind of moves and our focus shifted to other things. We started teaching and trying to understand what we do in order to explain it to our students. As our tango-microscopes got finer tuned, we discovered more and more details in the simplest things. A shift of weight became a very complex entity. Which is why our dancing got even more simple over the years. You become very humble, if you start understanding how things function or could work in an ideal case. The same with our musicality: in the beginning we performed to Pugliese. It was fun. But we knew nothing about the music. We just danced instinctively. Some of that was ok, most was awful. Today, we know much, much more about the music and the possibilities it offers, which is why we often are intimidated by a too high degree of complexity in a song. We know that we’d need much more time to practise in order to actually apply all that we know and hear in our dance. But we don’t have the time. Because we rather spend it preparing classes or didactical methods, writing class summaries or discussing concepts with our teacher-trainees who are equally nerdy. So we keep it simple - which does not equal easy. In 2007, we were asked to do a masterclass in a small festival. The whole thing was a little absurd, given that I did not see myself as a master. Detlef and I prepared a small seminar on centres of rotation with pictures to show how they are applied in different standard situations. It did not enter our minds to teach a more complex step, just because the workshop was labelled was called masterclass. This work was actually the foundation-stone for our teacher-training and you can imagine, how this is structured: a lot of analysis of basic principles, didactical work and pedagogical concepts, bodywork, musicality… We spend so much time understanding the transfer of axis of one leg to the other, that we barely have the capacity to talk about Entradas in the last module of the 100-hour-training. Ok… I exaggerate a little and I know that we are extreme in our wish to comprehend the world. But I think you know what I am getting at. For me, a master - a maestro - is first and foremost a teacher. Someone who understands very well, what he or she is doing. Someone who can explain a simple (or a difficult) context to another person. A master is someone who will grasp the complexity of a simple thing, someone who will realise the difficulties that a beginner or less advanced person has to face. Therefore a master will most likely be a humble person. I don’t know, if I am am there yet, but this is what I am aiming for. - A master can be a boss: master and servant. But this does not help very much in the tango-context apart from the fact, that sometimes leaders and followers are understood in such an (inappropriate) manner. - A more common interpretation for the term master is: Someone, who is very good at doing something, a champion. In particular when you come from an artistic or sportive context. After this lengthy discussion on Facebook I think, that this is where the issue lies: we do not agree on the definition of the term. When I hear the word masterclass, I am prepared to deal with teachers, who want to understand a specific context better, in order to be better prepared for classes. To put it in the sportive context: for me, master equals coach. The master does not necessarily have to run super fast, but he has to know how to make his trainee perform better. Confronting a group of teachers (having most likely very different levels of dance proficiency) with a super-long sequence that will take 1/3 of the class-duration to memorise and many months of hard training to do it perfectly does not make any sense. Unless you have a lot of time to explain the intricacies of the whole movement in order to learn something about the underlying principles. Others - upon reading the description masterclass - expect super dancers, the champions, the heroes. They expect the ones who can run faster, jump higher or farther. And it is perfectly valid to demand that these dancers cope with a lengthy and complex sequence and - ideally - understand what they are doing, because they have already done the research or because their teachers have prepared them well enough. After 17 years of feeling uncomfortable with masterclasses, I finally discovered, what my problem again is. Words. Understanding them. And using them correctly or in a well-defined manner. I am obviously a slow learner. Please review your definition of the term masterclass and describe such a seminar according to your interpretation. Then you’ll get the right clientele and no-one has to complain. This may need some more explaining on websites or on flyers. All of this boils down to a typical tango problem. How to use words properly in order to not create confusion. Please be clear about what you mean by lines, lanes or rails. Be specific about terms like entrada, sacada, cadencia or syncopation. As teachers, musicians or dancers we may have opposing definitions - this is totally acceptable. But we should stick to one of them and make it transparent which one we are using. Because language is complex and - what makes it even harder in our international tango word - most of us have to deal with non-native languages or speakers. So we have to take extra care of what we say in which manner. As someone who teaches in four languages, I am very well aware of this problem and am constantly searching for a clear usage of terms. Because I want people to understand what I say.